Starr Carter, a black American teenager, leads something of a double life. She lives with her parents, brother Sekani and half-brother Seven in a poor, black neighbourhood, Garden Heights, where gang membership, drug dealing and shootings are rife. But every day, 16-year-old Starr makes a 45-minute journey to a private school in a predominantly white, affluent suburb where she has almost no black friends. The issue is not that she can't fit in there - she has plenty of mostly white friends and a steady relationship with her white boyfriend - but rather that she's acutely aware that she's constantly modifying her behaviour in order to do so. Her wealthy friends don't come to her house in 'the ghetto' for sleepovers. She speaks differently at school. And although she can recite the Black Panthers' Ten-Point Programme off by heart, she's reluctant to be seen as the 'angry black girl'. One evening, Starr gets a lift home from a Garden Heights party from her childhood best friend, Khalil. When their car is pulled over by a white police officer, Starr is instantly fearful - and she's right to be. The officer shoots Khalil dead, and Starr is the only witness. The relative stability of her life is shattered, both at home and at school, and the implications of Khalil's death and Starr's testimony against the police have an alarming ripple effect as tension mounts and danger builds. This is a powerfully honest and important book, seemingly inspired by the Black Lives Matter movement. It has Starr's strong and distinctive voice - bright, perceptive and funny - at its heart and a vivid cast of characters who feel real and credible from their very first appearances on the page. There are few absolutes here: you'll be hard pushed to find a character who is 100% saint or sinner and motives and circumstances are often complicated. Starr's Uncle Carlos, for example, also happens to be a cop; her father Maverick, who now runs a successful grocery store, is a former gang member. The Hate U Give raises many questions, some of them uncomfortable, and it's rightly uncompromising in its portrayal of racism, whether it's outright victimisation, institutional prejudice or casual assumptions. 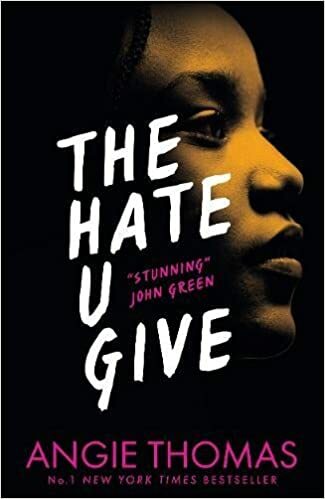 The Hate U Give is aimed primarily at teenagers (and I'd make it compulsory reading in schools, personally) but it's every bit as thought-provoking and absorbing for adults: it's a remarkably detailed exploration of the black working class experience in the US. This book made me angry and it made me sad (and if you're a white person like me and you feel neither of those things when you read this book, you really ought to take a long hard look at yourself), but it also left me feeling hopeful that the future is in the hands of activists as smart, brave and passionate as Starr.